Cubic Transportation Systems received a $54.5 million six-year extension to the company’s system support services contract with the Los Angeles County Metropolitan Transportation Authority (Metro) for its TAP fare payment system. This service extension covers the repair and maintenance of Metro’s rail fare collection equipment, TAP validators for regional bus operators, and the back office systems that process the TAP smart card data for Metro’s bus and rail system and 10 regional operators. The TAP system supports six rail lines, 80 stations and more than 4,000 buses regionally. Cubic maintains and supports more than 2,000 devices under this service contract. Since the start of 2013, approximately 21 million TAP boardings are recorded monthly on the Metro network including about 16 million on buses and five million on the rail system. Also during this time, in a typical month, almost 1.5 million transactions are made on the rail ticket vending machines resulting in more than $6 million in revenue. Metro began gate latching on the Cubic-designed TAP system in June, which will ensure that customers pay with their TAP cards. In addition to fare accountability, Metro is looking forward to improved ridership data and efficiency that will help the agency tailor services and transit demand. 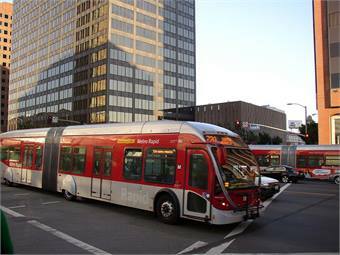 Today, in addition to Metro, the regional partners integrated into the TAP system include the Los Angeles Department of Transportation and the municipal bus operators of Culver City, Foothill, Santa Clarita, Montebello, Gardena, Norwalk, Torrance and Antelope Valley. The newest operator to join TAP is Metrolink, the commuter rail system serving the counties of Los Angeles, Orange, Ventura, Riverside and San Bernardino. In addition, Access Services, the paratransit operator in the region, provides a TAP/VISA card to enable TAP usage on fixed route service.